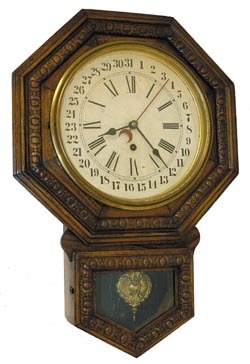 Waterbury Clock Co. calendar wall clock, "10 Inch Arion", C. 1915. Oak case is 22" high, short drop-octagon top, clean, original, excellent overall condition. 10 inch metal dial is very nice for the age. Hands, pendulum, glasses all original. Full black label inside the case. 8 day, time only movement in running order. Ly-Waterbury #195.